From budget Lucky Star and YO! 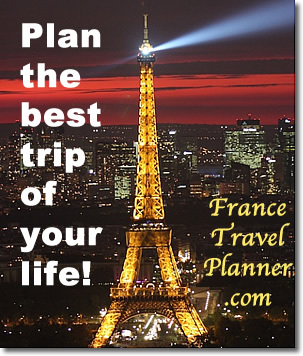 Bus through moderate BoltBus, Bonanza, Concord Coach, Greyhound, Megabus & Peter Pan to luxury LimoLiner, these companies serve Boston, Springfield, Providence, New York City and all New England. 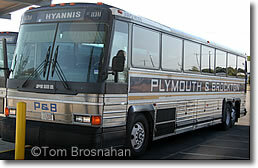 With limited train service in New England, bus is often the best way to travel if you don't have your own car. 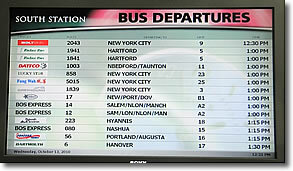 Bus departures monitor at Boston's South Station. MAXBus, now out of business (2017), ran a daily bus between Boston and Brattleboro VT via Framingham, Worcester, Leominster, Fitchburg, Gardner, Athol, Orange, Erving, Greenfield, and Bernardston MA. at Hyannis MA on Cape Cod. 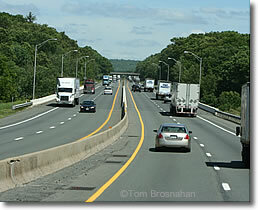 Eastbound on the Massachusetts Turnpike (I-90) toward Boston MA aboard a Peter Pan bus.